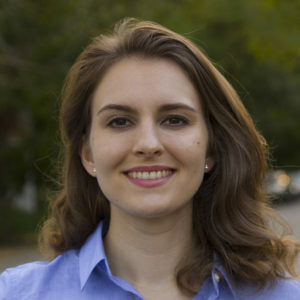 Kelsey is the librarian for Biology, Chemistry, Neuroscience, and Biomedical Sciences. She grew up right here in the Atlanta area and received a B.S. in Biology and a B.F.A. in Scientific Illustration from the University of Georgia. For a change in scenery, Kelsey went north to the windy city of Chicago and received a Master of Science in Biomedical Visualization from the University of Illinois. Kelsey misses the Field Museum, the lake shore, and some really good restaurants, but she doesn’t miss waiting at bus stops in -20° F weather. Although Chicago is a fun city, Kelsey came back to Atlanta to enjoy some warmer weather. What pizza is better, Chicago or New York? All kinds of pizza are welcome at my table. Just don’t put broccoli on it (broccoli belongs in stir fry, not pizza). I love frogs. 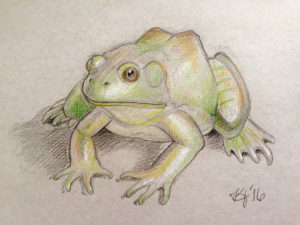 They’re not cuddly like puppies, but frog s can be funny and endearingly derpy, or beautiful in an alien sort of way. My ideal house would definitely include a garden and a frog pond. Part of my educational background is in science art, and I love drawing and designing. When I have a free day I like to sketch the animals at Zoo Atlanta and work on my personal art projects. I’ve also done a couple of recent projects for the library, icluding the signage for the new earplug dispensers on the 5th floor. What does your office at work look like? 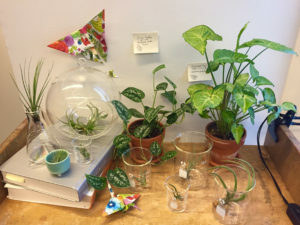 I like having color and life in my work space, so I’m cultivating a small office garden. Most of my air plants live in beakers to give my collection a laboratory theme. I’m working on filling out my wall decoration, which is an assortment of art and science posters I’ve collected or made. You have a great deal of talent Kelsey. I am a fellow batrachophile and am loving getting to know y’all with these profiles. oooh, a B.F.A. in Scientific Illustration! I’d love to be able to draw science things! Really interesting read and great drawing!